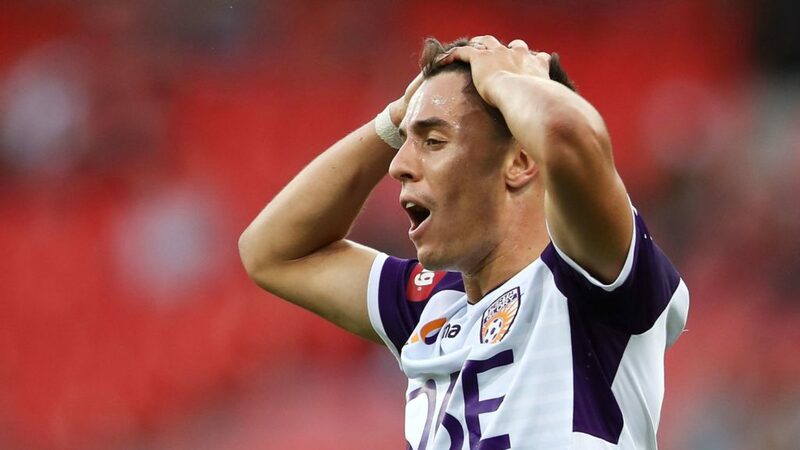 Perth Glory could clinch its first ever Premiers Plate in this weekend’s Rd 25 of the A-League if it defeats Newcastle Jets at home and second placed Sydney FC drops points against rival Western Sydney. With just three rounds remaining, only a catastrophic choke could result in Perth losing its grip on the Premier’s Plate. More uncertain than the race for the plate, is the three way tussle for fourth spot with Phoenix, Adelaide City and Melbourne City. Just one point separates the teams. In last week’s matches, Sydney came out on top of Victory in the big blue, however the result was overshadowed by the controversy surrounding the state of the pitch and the role it may have played in Victory player Terry Antonis’ injury. Fortunately, Antonis escaped serious injury and has been named in this week’s Victory squad. Not so fortunate is Adelaide United forward Apostolos Stamatelopoulos who has received a two match ban for his reckless tackle on a Phoenix player. The suspension soured the match for the young striker who was on a high after scoring a brace of goals. This week’s action kicks off in Brisbane. Phoenix’s loss to Adelaide United last week brought it back to earth and closer to the chasing Reds and Melbourne City in the race for fourth spot. Whilst Phoenix ‘s attack led by Roy Krishna may have been a potent force this season, Phoenix’s defence has been a concern in recent weeks. It welcomes back English central defender Steven Taylor. Phoenix should be too strong for the Roar, which has lost four straight matches and is using these matches to give a number of young players valuable senior experience. Both teams go into this crucial match on the back of welcome wins last week, and with a top four spot and a home final up for grabs. The key could be their attacks. City has Maclaren and McGree as well as Dario Vidosic for back up. The Reds appear light on in the final third especially with the suspension of Stamatelopoulos, and they may be over reliant on Craig Goodwin. The home side, which currently sits in sixth spot, will be pushing hard for a win. Sydney will be heavily favoured to continue their dominance of this derby in recent years. It takes good form into the match with a win in last week’s match against Victory and a creditable mid-week draw in the ACL against Shanghai SIPG. The Wanderers will be hoping fatigue sets in for Sydney FC with this being the Sky Blues’ third match in a week. Veteran forward Mark Bridge returns for the Wanderers for what could be his final derby before retiring. Victory will be determined to get back to winning ways after a disappointing week, in order to stay in the hunt for a top two finish. Despite the fatigue after a long midweek flight to China, it should have too much quality for the struggling Mariners. Good news for Victory is the rapid recovery of Terry Antonis who is named in the squad. Kostas Barbarouses will look to add to his impressive tally of 14 goals this season. Whilst for the Mariners, young forward Peter Kekeris gets a call up to the squad. In the last match of the round, Perth Glory could have the opportunity to celebrate its first ever Premiers Plate depending how Sydney fares in its derby match on Saturday. A win over the Jets, could see Glory clinch the Plate and celebrate in front of home fans. They should be able to get over the Jets, despite the absence through a shoulder injury of star winger Chris Ikonomidis. Jets coach Ernie Merrick has indicated he will promote youth in the last three rounds of the season.